Psalm 70 is a short, to-the-point prayer for deliverance from enemies. David brings his needs before God and pleads for God to rescue him. Nearly half of the psalm, however, expresses a desire for David’s enemies to be disgraced. He prays, “Let those be ashamed and humiliated who seek my life” (2). And on the one hand, the request isn’t terribly shocking, because we’ve seen him wish much worse on his foes–but on the other hand, isn’t it superfluous? Why add insult to prevention of injury? Recently, in a Twitter conversation about voting third-party, I told a friend, “I think one could make a case that no one should shame anyone for anything.” But now I find myself wondering: would God be remiss in shaming David’s enemies? Should they feel shame for their desires and actions? Of course, the answer depends on what you call “shame.” But if you consider the Golden Rule, “Treat others the same way you want them to treat you” (Luke 6:31), you have to wonder: would anyone ever want their esteem to fall in the eyes of their peers, or to feel bad that others saw them do what they did? Jesus’ words provide a practical test that we can apply if we ever need guidance as to whether we should shame a particular person for a particular time, but still, questions abound. Such as, you know, the Question of the Day. Question of the Day: Is there ever a moral imperative to shame a person? If so, under what conditions? 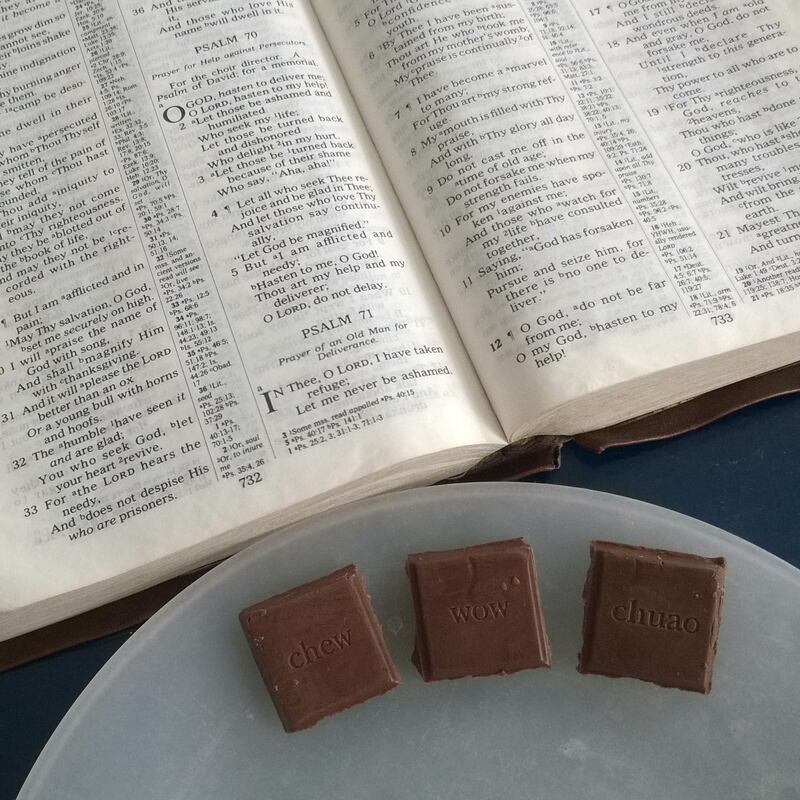 Thanks to a contribution from a generous reader, I have some new chocolate. Chuao (pronounced chew-wow) is a Southern-California-based chocolatier named after the cacao-producing Chuao region of Venezuela. Their chocolate is ethically-sourced, and I can’t tell you how important it is to make sure your chocolate doesn’t employ slave labor and fairly treats those involved in its production. Well, maybe I can. 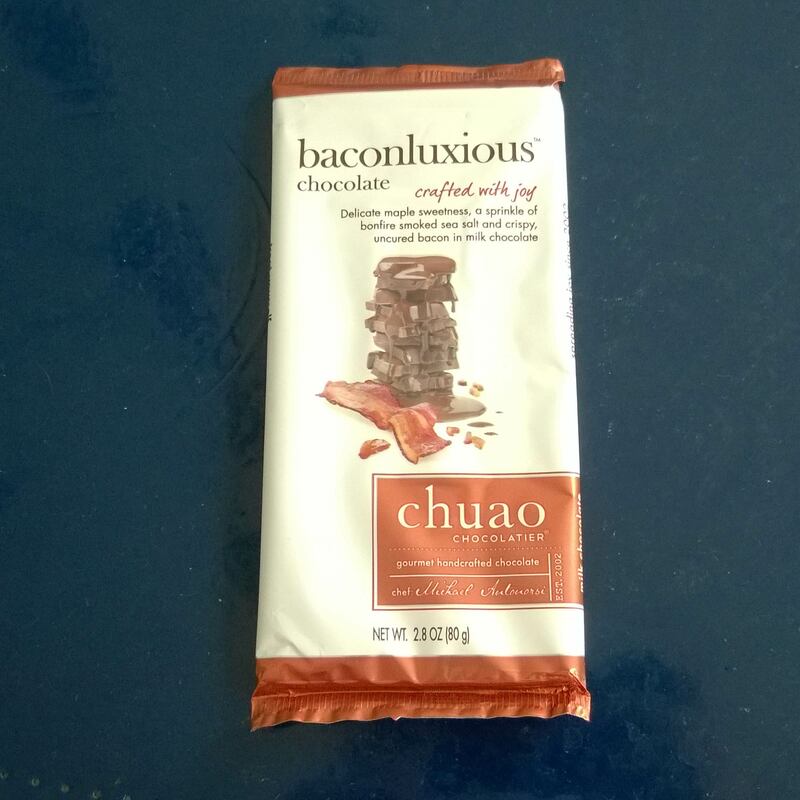 Anyway, today’s chocolate is Chuao’s “Baconluxious,” whose name is a portmanteau of “bacon” and some other word? Luxurious? Maybe luxe, which I am surprised to discover is an actual word? I don’t know. The bacon flavor isn’t outstandingly strong and mostly just adds a salty taste to the chocolate’s sweetness, but all in all it’s pretty tasty. Thanks again to our chocolate contributor! If you would like to contribute a chocolate bar, hopefully one of these days this blog will be able to support the cost of a P.O. Box so that you may do so wherever you are. Until then, if you enjoy Chocolate Book, please share it with a friend! We’ll get there. Posted in Daily Reading, Psalms.Tagged bible, christianity, David, evil, God, prayer, Psalms, scripture, shame, violence.